Indie publisher Nicalis has confirmed that it is bringing Tiny Barbarian DX and Ittle Dew 2+ to the Nintendo Switch, as well as Blade Strangers and The End Is Nigh, both of which we already knew about. Coded by StarQuail Games, Tiny Barbarian DX offers "two-player cooperative action, unlockable game modes and multiple homages to classic 8- and 16-bit games in each of its four lengthy episodes," and has retro-themed visuals and chip tune soundtrack. Title Dew 2+ sees the return of Ittle and Tippsie in an "upgraded and expanded" version of the original game, coded by indie studio Ludosity. These two titles are due for release in Q3 2017. Do either of these take your fancy? Let us know if you'll be downloading them on Switch when they go live on the eShop. It was released on PC close to 4 years ago and still only has two episodes out of four done. I am so pumped for Ittle Dew 2+!!!!! I played the original on mobile and it is by far the best phone game I ever played, and I played a lot of hearthstone on my phone. Cannot wait to dive into the sequel! little dew looks alright...the other game looked like a meh. So, I'll still be broke all this year is what you are saying. Just Blade Strangers for me. 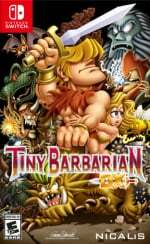 Tiny Barbarian DX looks neat. I've heard Ittle Dew plays better than Oceanhorn, though it's not​ nearly as pretty. Does anyone have any experience with both? Recommendation? Wait. 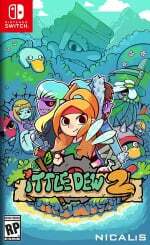 Is Ittle Dew 2+ an updated version of Ittle Dew 1 or Ittle Dew 2? I never heard of Ittle Dew 2, so I'm guessing it's 1. Ittle Dew 2+ is cute. Looks sort of like a Zelda game. How has no-one pointed out the 'Title Dew' typo yet? Hey Nicalis! Where's that 90's Arcade Racer at? Have they said when The End is Nigh will be hitting Switch? Hope it's not too long after the launch on Steam. I want that one so very badly! All rubbish. Nicalis is rubbish. @Brutchie-bear @Ralizah Not only that but also this. Yay! Tiny Barbarian is great, can't wait to get it on NS. Little Dew 2 + for me. The first one on Ouya was great! @Gen0neD Ask Pelican13. He seemingly dropped off the face of the planet. Haven't done some good gnome kicking since Golden Axe. Is tiny barbarian perhaps a descendant of Ax Battler? Both definitely look like fun, though I still have to pick up Ittle Dew. Both are fantastic games, i wish they were physical releases though. Tiny Barbarian looks just my sort of thing. Sweet more 4.99 game for 19.99 from Nicalis. Got to love that! Just kidding. Definitely getting little Dew 2 never got to play the first one. Will wait on Barbarian and see how that goes. I don't know why but I'm picking up my 3rd version of Cave Story this week. Hope the Switch version is nice.. I just thought that Amazon Prime price of 23.99 was cool for the Cartridge. I really liked Ittle Dew 1 on Wii U. It was a neat little topdown adventure, heavily inspired by Zelda I rated 8/10 back then. I was disappointed when Ittle Dew 2 skipped Wii U, but I'm more than happy to pick up Ittle Dew 2+ on Switch.